Jonathan Sebelius sees the faction fight within his department as a battle between Good and Evil, the outcome of which will be of cosmic significance. He’s a true believer in the value of Literature with a capital L, and lies awake at night brooding over the excision of Chaucer and Shakespeare from the requirements for the Bachelor of Arts in English at Parnell State University. Jonathan simply wouldn’t want to live in a world where people no longer study poetry. 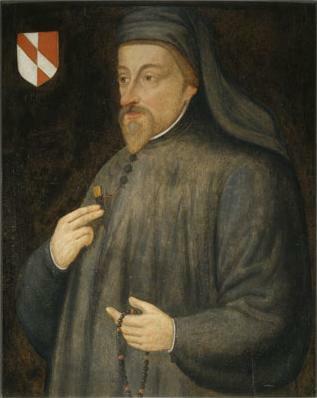 Astronomer, alchemist, courtier, and poet Geoffrey Chaucer. Source: Wikipedia. The Department of English Advisory Committee meeting was not proceeding smoothly. In fact, disaster seemed inevitable. Lynn Melton, the department Chair, was seeking the committee’s recommendations on the names of eminent scholars to perform an outside review of the Ph.D. programs. The department’s two programs were locked in an interminable battle for limited resources. Interminable, that is, until the day that one eventually managed to grind the dust of the other beneath its metaphorical boot. Therefore, the choice of reviewers was of paramount concern to both sides. There was a lively murmur of approval from the LR half of the table, who were always much more vocal, and more united in their ambition to dominate, than the Literature faculty— a motley crew who had little in common with one another. The British literature scholars were divided into Medieval/Renaissance, Victorian, and Modern, while each Americanist was a crotchety subfaction unto him- or herself. None of them could agree on where to order out for lunch, much less acknowledge and deal with the fact that they were rapidly being outmaneuvered by their cannier, more pragmatic cousins in the fashionable Rhetoric program. “Joe Padilla at Stanford,” said Sebelius. “A brilliant mind.” Padilla was a noted scholar of Renaissance literature who also had a longtime gig writing op-ed pieces for The New York Times. The meeting continued, with one name after another being vetoed by either Jenko or Sebelius. “Unacceptable,” said Jenko. “After all, Lynn, as the Chair, you’ll be making a recommendation to the graduate college and writing the final report. Since you’re a Shakespeare scholar, don’t you agree that Rhetoric suffers a disadvantage?” As she opened her mouth to disagree, he continued in saccharine tones, “Oh, I know you have the best of intentions, but you could hardly claim to be completely unbiased. And that’s why I’m making a motion that Rhetoric be allowed to select three names, and Literature one,” he said quickly. Before Lynn could respond, Tilda Blumenthal seconded the motion, adding a “friendly amendment” that there should be a secret ballot. Lynn’s heart sank. That’s it, then. On the committee sat one faculty member in Literature, Sylvia Schmidt, who was not yet tenured. With Gerhard Dahl now about to receive tenure in Rhetoric, Sylvia couldn’t afford not to support the new majority in the department. Sylvia had already received multiple visits from Jenko, Blumenthal, and Regan, who made it known that if she expected their votes, she would be wise to “support all the programs in the department, not just her own.” Sylvia had come to Lynn’s office to apologize in advance for her apostasy. Lynn sympathized with her, and told her to vote her conscience. In spite of the “secret ballot,” the sentiment of every committee member was well known, and Sylvia would be casting the deciding vote. Lynn exchanged glances with Sebelius. A muscle was twitching in his jaw, and to her practiced eye, he looked close to a meltdown. But he was an experienced fencer. He would not allow his anger to become another weapon for Jenko to use against him. She could go to the Dean and complain about the dirty tactics Rhetoric was using, but it would only give weight to their constant accusations that she was negatively disposed toward them. And George would be as reluctant to overturn a departmental vote as she was. I’m sorry, Jonny. Notes: If you’re disappointed at the brevity and subject matter of today’s chapter, I can only promise that upcoming entries will be more… satisfying. The twitching of a muscle in the jaw to indicate suppressed emotion is something of a cliché, and yet I thought it was right for Jonathan. He’s all about suppressed emotions! It seems to be a manly thing, because one never hears of women with twitching muscles. Certain actors have the ability to move their jaw muscles in order to telegraph tightly-controlled anger. 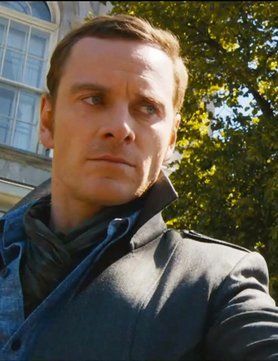 Fassy is said to be very good at it! Oh those dept politics… Seems to happen everywhere, no matter what faculty we are talking about. Sadly, yes! Human nature being what it is 🙂 Academics seem to have a special zest for it. LOL! I’m glad you enjoyed his tirade. I did too, even though I’m not as opinionated and idealistic as he is about literature. I see value in studying all kinds of texts, even though some are worth more to me than others.